PU machinery supplier Hennecke is looking back at a very successful JEC World in Paris. The company presented the new Streamline MK2. 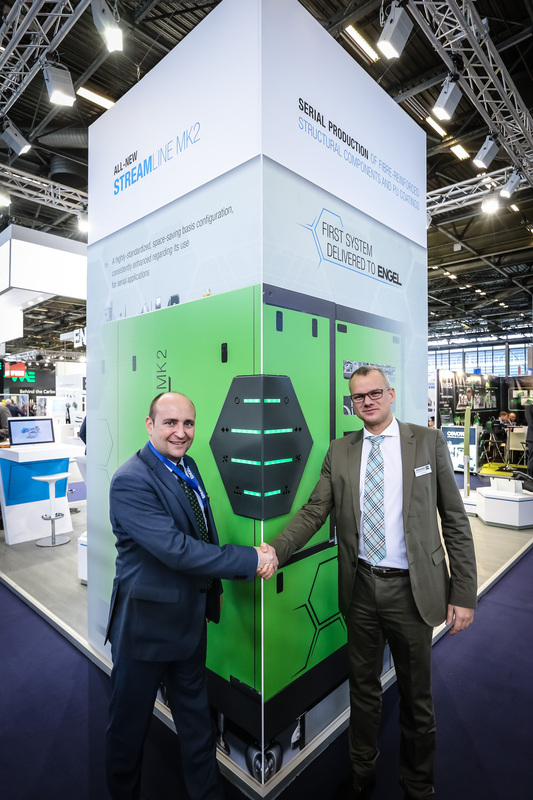 Jens Winiarz, Head of Composites & Advanced Applications, symbolically presented the first ever Streamline of the second generation to long-standing development partner Engel Austria GmbH. Matthias Mayr, Head of Engel Composite Systems, received the metering machine full of expectation. The machine at Engel’s technology center for lightweight engineering composites will replace the previous model which has been used to develop a variety of new products up to the serial production stage for sampling in HP-RTM applications. Engel and Hennecke have been driving forward the interdisciplinary development of fibre composite technologies together with other partner companies, customers and universities. Thanks to close cooperation with its partners, Engel is able to offer highly integrated system solutions for producing fibre-reinforced plastics from one source. "Together with Hennecke, Engel has already realised a number of successful and credible projects in our technology center," Mayr explains. "With the new Streamline machine generation we are taking our collaboration to the next level." Building on the sale of over 70 Streamline machines in the first generation, developers, manufacturers and raw material suppliers have been able, in many ways crucially, to develop a variety of processes in the manufacture of fibre-reinforced structural components (HP-RTM technology) and in efficient surface finishing using polyurethane and polyurea coating (Clearrim and clearmelt technology), leading to diverse serial applications. The Streamline metering machines have become the industrial standard across the world for HP-RTM applications. The established machine system has now been successfully used in over 40 serial applications. While the focus of the market launch of HP-RTM technology was still largely on research and development equipment, which was primarily used to design components for serial production, producers are now increasingly asking for standardized machines with high requirements in terms of availability, service and maintenance. As many of the newly developed products have since entered mass production, this market trend is a logical consequence of the successful development activities. The MK2 provides Hennecke customers with a highly developed product, precisely adapted to the process availability of serial applications in the HP-RTM, Clearrim and clearmelt processes. The second Streamline generation offers further impressive benefits. Compared to competitors' machines, production flexibility increases considerably thanks to the ultra space-saving layout of the machine on a mobile frame which can also be lifted by crane. The plant automation is also particularly flexible: The Streamline MK2 is equipped with a wireless operator panel, which enables on- the-spot operation of all process parameters independent of location. The efficient heating configuration is also impressive in terms of innovative detailed solutions: the heating and metering cabins are joined together using quick-locking mechanisms which allow for easy dismantling at any time. This ensures that all main components such as the high-pressure pumps can be exchanged very quickly. The Streamline MK2 is fully equipped for industry 4.0. The machine can make all process-relevant data available to the user via an interface. Hennecke customers are impressed by the decisive advantages offered by the new generation of machine: the polyurethane experts have already received confirmation for four machine systems from large processors. Another Hennecke highlight at the JEC trade show was the presentation of the newly developed chopper for glass and carbon fibers. The device provides a plug and play solution for all LFI systems on the market and can therefore be easily retrofitted to existing production systems. A patented cutting process gives the cutter a significantly longer service life. With an output of 300 g/s, the blades last six times longer than those on conventional cutting systems. The blades only need to be exchanged once a glass fiber output of 1000 kg has been reached.